Valerie Trimarco is very pregnant, very lost, and very stuck. Her car is jammed in a snowy Wyoming ditch, with contractions coming faster and harder when a white knight in a cowboy hat shows up. 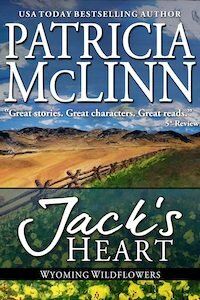 Ranch foreman Jack Ralston’s job is to handle anything that needs handling with cool, quiet competence, including a baby who’s decided it’s time to come into the world. A few years later, Valerie returns to Knighton, Wyoming. Now a successful mommy blogger, she wants to thank the man who rescued her and delivered her baby. Okay, maybe she’s wondered about him a time or two over the years. How could she not? So she conspires with his employers to spring a surprise party on him for a proper thank-you. It hadn’t been her best decision. And that was saying something, considering some of the not-so-great decisions she’d made. Including getting pregnant by a guy she now acknowledged she’d known in her bones wasn’t the guy for her. Including heading as far away as possible from her family in Gloucester, Massachusetts. Every last one of them would have rallied around her. Which was precisely why she’d gone to Port Orchard, Washington. She’d gotten into this on her own, she needed to handle it on her own. Valerie Trimarco, woman in charge. Although, she had done okay in Port Orchard these past months. She’d supported herself, made some good friends, had everything arranged for the birth. Every detail lined up and ready to go. Right up until this overwhelming need to have the baby in Gloucester — to be home — swamped every island of sense she possessed. All thoughts of handling things on her own or even with the help of her friends disappeared. All she could think of was getting home. Home. So she’d packed her car and headed for Massachusetts. That still wasn’t such an awful decision. After all, the airlines limited flying this close to the due date. Besides, she liked driving alone. And her car was reliable and sturdy. However, even reliable and sturdy cars eventually run out of gas if they’re kept running. Running the engine for brief periods of warmth had seemed reasonable once the car got stuck in the snow-clogged ditch. Of course it wouldn’t have gotten stuck if she hadn’t had to swerve to avoid that cow when she came around the curve in the road. On the other hand, she wouldn’t have been on this cow-infested road if she hadn’t had to keep changing her route because of the snow storm sweeping down from the northwest. From the last report she’d heard, I-94 should be closed right about now. So she’d made the right decision to take 1-90 out of Billings, even though it had soon become clear the storm would hit her before she got far enough east to get ahead of it. She’d adjusted again, planning to reach Buffalo, Wyoming, then swing south by way of I-25 to connect with I-80 , which also ran east-west, but — she hoped — far enough south to miss the storm. That was not to be, either. She’d caught a radio report about a backup before Buffalo from an accident that had spread lumber across the highway. By the time it could be cleaned up, the storm would have arrived and no one would be going anywhere. So she’d created her own detour, taking a road south. When it ran out, she turned east. That road gave up, too, so she picked up another heading south. And did another east-south combo before she reached this one. She’d been heading east a while, so she really should have reached I-25 … if it hadn’t been for that cow. Pushing was out of the question, considering her condition, but she’d tried rocking the car out of the ditch like the trained-to-drive in snow New Englander she was. Alas, no amount of rocking helped when the nose of your station wagon was sucking in mud and snow. Then the wind picked up, blowing around curtains of snow. Not light and airy sheers, either. More like heavy velvet. A sound and a shadow — later, she never could remember which caught her attention first — jerked her head toward the window of the driver’s door. It looked like a brown blanket hanging beside the window with — was that a boot? Another sound came, this one like a voice, though she couldn’t make out words. Then, at the very top of the field of vision allowed by the window, she saw a pair of eyes. She blinked, then squinted, finally making sense of what she was seeing. It was a man on a horseback. He’d bent nearly double, apparently to look into the window. He had a scarf muffling the lower part of his face, and the top part covered by a cowboy hat secured with a second scarf tied around it, leaving only the eyes. “Ma’am? You okay?” He shouted it this time, and she realized it was what he’d said before. She pressed the button to lower the window a few inches. At least there was enough juice left for that. She hoped there’d be enough to raise it again, because it was going to get very cold in the car very fast with the window even partially open. She panted as the contraction ebbed, knowing it wasn’t anywhere near to the worst, since she’d already had a few of those. “Ma’am, are you okay?” he asked again. She broke off, because this contraction was not a mini and it wasn’t playful. She concentrated on trying to remember her training, trying not to tense up, trying to keep the hiss through her teeth a hiss and not a scream. Now she’d done it. She’d rattled the cowboy. The contraction eased, not quite passing, however. “I’m in labor,” she said with uncharacteristic brevity. She quit because the cowboy was leaving. Without even getting off his horse. He’d turned the horse and started back along the side of her station wagon toward the road. She stuck her head out the window and saw the swish of the horse’s tail as it stepped up the embankment toward the road. A sound from the passenger side of the car yanked her head around to it. Over the top of the shade to her favorite lamp, which had survived the slide into the ditch because the passenger seat was packed as tightly as the rest of the car, she realized there was something outside that frosted window. Two somethings. The cowboy and horse shape had separated into two separate shapes. The cowboy shape was looping the reins around the passenger door handle. Her eyes felt hot, but tears didn’t form. Then he shouted something through the closed window she didn’t hear. She closed her window before opening the passenger window, because she wasn’t a complete idiot, and if there was only enough juice for one move she wanted it to be to close a window. This way if it stopped working after she opened the passenger window there’d only be one window letting a blizzard in. “Wait a second,” she snapped. Then the window was down. But the cowboy shape was moving, leaving the horse shape by the passenger door. She raised the window, but that didn’t help much with keeping the outside out, because in another moment he had the tailgate open. As the contraction relented, she recognized she’d been hearing the sound for a while. The cowboy was moving her things around on the cargo deck of the old station wagon. She started to turn to see what he was doing, thought better of it, and tilted the rear view mirror. She could only see to the back in part of the mirror’s view. In the rest, he’d piled her belongings up to the roof. “I won’t be able to drive,” she protested. “You’re blocking all my sight lines.” Even family who gave her grief for being impulsive, emotional, and having wanderlust acknowledged she was a great driver. A little fast, maybe, but safe. “You’re going to sit back there?” That didn’t seem very sociable. He wasn’t listening. Because partway through her description, he’d backed out of the tailgate and dropped it closed behind him. “What were you doing with my cape?” she demanded. That stopped her, because she had no idea how much a bale of hay weighed. And while she was stopped, he scooped her up. Out of self-preservation she put her arms around his neck. She figured if he started to drop her she could hold onto his neck long enough to soften her landing. “And you’re having to carry me through snow,” she added. His breath puffed warm across the slice of her cheek exposed between her pulled-down knit cap and the scarf wrapped up around her chin and mouth. “Why are you doing this? I was fine where I was.” Sort of. The wind had strengthened. If his mouth hadn’t been practically in her ear she might not have heard his low voice through all the layers of cloth. He grunted. Might have been part of a chuckle. Might have been in pain from trying to support her elephant-like body. He turned the corner to the back of the car, and the going got a bit easier, apparently because he’d tamped down the snow during his box-rearranging. He set her on her feet, and lifted the tailgate. “My cape!” She snatched the nearest section of fabric and reeled it in, bundling the fabric in her arms. He moved as if he intended to lift her again. She evaded it by swinging her arm away, and nearly lost her balance on the snowpack underfoot. She saved herself by sitting — hard — on the edge of the tailgate. “Can you get in by yourself?” he asked doubtfully. And she did. By inching herself backward like a panting, heaving cross between a crab and a rhinoceros. Each time she moved backward she scrunched up the blankets a bit, and he pulled them down. As soon as she got far enough in that — with her knees bent — the tailgate could be closed without performing a double footectomy, she flopped back, trying to replenish her oxygen. The wadded up fabric of the cape sat on her chest. She watched it rise and fall with each breath. She supposed she should be grateful she hadn’t had another contraction during these maneuvers. He made that sound again, and since he was no longer carrying her, she had to conclude it had more to do with amusement than pain. In the time she took two breaths, he was out and had dropped the tailgate down, cutting off the wind. She started trying to fold the cape to put it somewhere safe. But the voluminous flow of fabric made it more than a little tricky while she was lying down and with barely enough room to stretch her arms. She could just make out his voice over the wind, which probably meant he was shouting into the radio. She listened harder, trying to assess his tone. Then she felt the serious pain edging back in. Sliding in inexorably, like an oil slick being brought to shore by the tide. She fisted her hands in the cape’s material. “How’re you doing?” he said from someplace close by. He had to be, right? She couldn’t hear him that clearly if he were outside, but she hadn’t heard him get in— Oh, hell, who cared? “The contractions are coming— Oh … Oh, God!” Pain swallowed the universe and her along with it. There was nothing but pain. There would never be anything but pain. It receded, but she knew that was just a ploy so it could hurt more the next time. Higher and closer with every swell. She knew the ocean’s ways. This was an ocean of pain. But at least, for now, it let her see what was around her. She looked up into the cowboy’s face. He was partially kneeling beside her, his hat was gone. He had light brown hair with a weird dent in it. And eyes somewhere between blue and gray. “My cousin has gray eyes,” she said between pants. Why was she panting like she’d run ten miles? She screamed. Not like at a scary part in a movie scream, where you follow up with a nervous laugh. But a scream like when the pain that swallowed you had all its knives out slicing every little bit of you. When she reached the border between the ocean of pain where she would never leave and the world that other people inhabited, she realized the cowboy had his hand on her forehead, stroking back her hair. She locked eyes with him and opened her mouth to point out again what a stupid, horrible, bad, bad, bad idea this was. His calm, sad eyes stared back at her. “Right. I’m going to need some room. So—” He hooked her under her arms and slid her more toward the front of the car. She was sitting up more than she had been, which was slightly more comfortable. Like being on a bed of pins instead of needles. He spread the cape over her, then started backing up. “Where are you going?” She didn’t sound panicked, because she didn’t panic. She was up for anything. Ready for any adventure. Yes, sir. That was her. “We gotta get you out of these pants. Fast.” He opened the tailgate and stepped out, having to remain bent over so he didn’t hit his head. He started on her shoes, but left her socks on. “Won’t be hard. I haven’t worn anything but elastic for months. Never thought I’d miss zippers, but — Wait. Wait!” He’d started to tug on the bottom of the pant legs, which were cooperating like they thought they were going to get some action. “Ma’am.” He crawled back in beside her, tugging the tailgate closed after him. The wind howled at having its fun thwarted. “You and me,” she repeated. “— and everything was okay, because you came into the world, bright and beautiful and healthy and screaming,” Val said, concluding the expurgated version of her birth that Addison Rose Trimarco loved to hear. And now everything was going to be okay with this, too. It was a good idea. A great idea. Her followers would go nuts for it. That’s why she was back in Wyoming for the first time in three and a half years. “No bites,” Addie ordered. She’d shortened the traditional don’t-let-the-bed-bugs-bite goodnight wish into a command to the universe that matched her spirit. Then she closed her eyes and went to sleep. For the first two-and-a-half years of her life, Addie had been what could be kindly called an erratic sleeper. That’s how the blog, then the podcasts had started. With her own sleep echoing her daughter’s disjointed patterns, Val had found herself awake and longing for connection at the oddest times and often with only snatches of moments to try to fill the craving. So, rather than harass family and friends who didn’t keep Baby Hours, she’d blogged. And she’d discovered a community of other mothers feeling as if they’d been unplugged from the universe. She gave them a voice through “Mommy: The Truth Zone” and they gave her astonishing loyalty. Everything blossomed from that. She made a living now at something she loved. Nearly as miraculous, Addison had gone to sleep one night almost a year ago at a normal time, and that was that. Val slipped out of the cottage’s solitary bedroom. The double bed had already been there. Her kind hosts had added the youth bed for Addie. In the living room, Val picked up her keyboard, plugged it in to the travel monitor, and started typing about the miracle of Addie going to sleep. Remembering the years of sleepless or fragmented nights and days, she hoped her earlier travails — and their eventual end — would give someone out there tonight the knowledge that they weren’t alone. That there might be a full night’s sleep somewhere in their future. It was strange not to be telling her readers about what she’d been doing today. But that would ruin the surprise. So it had to wait until tomorrow, when she would finally thank Jack Ralston. Really thank him. With a surprise party to celebrate what he’d done for her and Addie, joined by the people who knew him here in Knighton, Wyoming. And then she’d share the party and the thanks and how wonderful he’d been with all her followers for the first time. She should have done this years ago. Well, okay, not at first. Because at that point in her life taking a shower had been an accomplishment that left those Mount Everest-climbing folks in the dust. A surprise thank-you party in Wyoming? No way. Even when Addie started sleeping, it had taken a while to rebuild her own energy. Plus, there was the issue of when. On Addie’s birthday, as a sort of anniversary? Couple problems with that. She had first-hand experience of Wyoming in January. Also, shouldn’t Addie get to have fun on her birthday with her friends? And then there was the fact that Val’s family and friends in Gloucester would shoot her for depriving them of celebrating that day with Addie. With the birthday out, that left too many other choices, none better than another. She’d dithered along, pretending she was waiting for the perfect moment when she’d just been procrastinating. Until opportunity knocked on her door — or dropped into her inbox, depending on how you looked at it — and refused to go away. Fate had said now. So, here she was. Everyone had been incredibly supportive and helpful here in little Knighton, Wyoming. Particularly the family that owned the Slash-C Ranch where he worked. Not even at her most optimistic could she have dreamed up better people. They were all in on the surprise. Excited about it. Had not only made it possible, but fun. More than okay. Great. Terrific. Super. All right for paper-lovers! JACK’S HEART is now available as a trade paperback (that’s the bigger sized paperback. Hope you’ll consider getting yours now – it’s at $10.99, which means I just about break even. <wg>. But I know lots of you folks love reading paper editions, so I want to offer it to you at the lowest possible price.